Ariana Grande stumbles around during a live performance on Ellen, John Legend defends Kanye West, and Cassper Nyovest is on the search for a gogo. This and more on Thursday's #HotGoss with Jane. 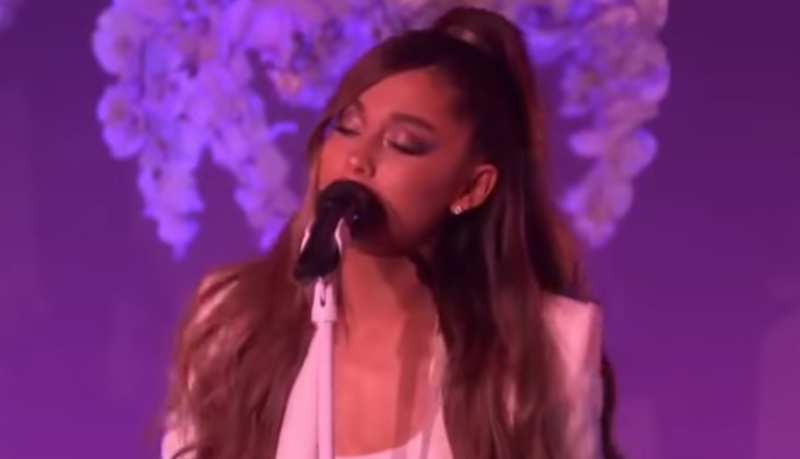 Days after releasing her new song, 'Thank U, Next', about exes Pete Davidson and Mac Miller, singer Ariana Grande made an appearance on the Ellen show to give her audience a First Wives-inspired performance. But like life, not everything goes according to plan. The 25-year-old beauty, clad in white, almost fell on-stage, and even missed a few beats - it wasn't her best performance. However, Grande took the opportunity to innocently smile her way through and came through like a pro. Even though she had a rough time on stage, generally it has been a big week for the God Is A Woman star. She dropped her new song, and also won the Billboard Woman of the Year award which celebrates her contribution to the music industry. She will be awarded the title at an event on 6 December in New York, USA. Hey, even celebrities have bad days, right? Either way, Ariana Grande soldiered on and sang her lungs out. There are a few things we can rely on Kanye West (Ye, if we have to use his new name) for - stupid shoes, drama, and honesty when it comes to his views on politics. Earlier this year, Ye had a fallout with his mate, John, and tweeted out some of the messages they shared with each other which showed Legend's stance on politics. Ye has had a few outbursts on social media before, and while some have blamed it on his alleged bipolar disorder, the Famous hitmaker has claimed that he doesn't have the disorder and blames it on sleep deprivation. Irrespective of his mental state, John adds that he's tired of people 'armchair diagnosing' Kanye and that we should leave it up to the professionals to see what's happening 'upstairs'. "A lot of people have tried to armchair diagnose him, but I leave it to him and his doctor to discuss what's going on in his brain," Channel24 reported that John said. Help Cassper Nyovest find this gogo, please! East Coast Drive's Bongani and Mags recently interviewed Cassper Nyovest, and they had an opportunity to chat about his bond with HHP, rumours about Nadia Nakai, and more importantly about his mission to #FillUpMosesMabhida. Nyovest is certainly going all out to #FillUpMosesMabhida, and we cannot wait to witness the magic that will unfold on Saturday, 1 December. If you follow him on social media, you would see the extent at which he's going to get people to come and watch him perform live on stage. Currently, he's searching to find a gogo who participated in the #SerengCirocMoNgwaneng which trended on social media. He's now turned to the Twitter streets to help him find this gogo. "PLEASE RT Can’t stop watching this video!!!! I want to meet this Granny and fly the grandkid who shot this video to #FillUpMosesMabhida. Please find them for me. Twitter, I’m counting on you!!! #SerengCirocMoNgwaneng," he said. Think you know who this gogo is?